Kicking off today is what’s sure to be a busy week. Both Apple and Intel have events scheduled over the next few days, with an Apple product announcement and Intel’s annual developers forum taking place respectively. But first blood for the week will go to Sony, who in a Japanese press conference has announced a duo of new Playstation products: a new revision of their PlayStation Vita handheld game console, dubbed the PS Vita PCH-2000, and a Vita-based TV micro console dubbed the PS Vita TV. Starting off with the new revision of the PS Vita, the PS Vita 2000 follows in the handheld standard of progressive revisions of a console getting thinner, lighter, and cheaper. While Sony is not dramatically overhauling the design of the PS Vita, the PS Vita 2000 sticks with the Vita’s standard design while shaving off both depth and weight. The new Vita comes in at 219g and roughly 15mm deep, making it 15% lighter and 20% thinner than the original Vita. Sony is also making some internal changes, certainly the most controversial of which is replacing the Vita’s 5” 960x544 pixel OLED screen with an equivalent size and resolution LCD screen. 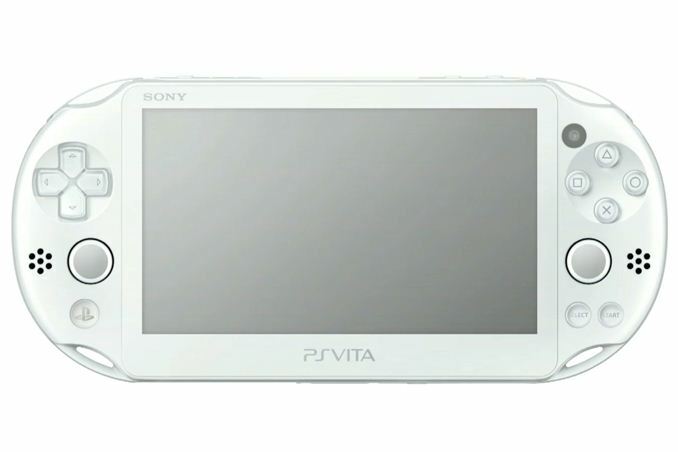 Unfortunately as is the case with press conferences we don’t have any immediate details beyond what Sony has put in the conference, but looking at the video of the announcement there appears to be some color wash-out occurring on the off-angle Vitas, which would indicate that we’re looking at a TN screen. Meanwhile Sony is also making some changes to the Vita’s storage subsystem; the Vita 2000 will come with 1GB of built-in storage, rectifying the fact that the original model didn’t have any built-in storage, making the purchase of a relatively expensive Vita memory card a practical requirement. Though in practice 1GB won’t go very far, and Vita memory cards (which are still supported) would be needed for large patches, games, and DLC. On the positive side, Sony is dropping the Vita’s proprietary USB/accessory connector, to be replaced with a standard microUSB connector. Interestingly Sony is saying that the battery life of the Vita is now up to 6 hours (from 5 on the original), which would indicate that power consumption has been reduced despite the loss of internal volume for the system’s battery. The original Vita’s SoC was manufactured on Samsung’s 45nm process, so the timing is right for Sony to move to 32nm/28nm, likely once again being manufactured at Samsung due to the Vita SoC’s unusual Wide I/O SDRAM. At the same time the switch from an OLED panel to an LCD should also provide power savings for Sony, though by how much is unclear without knowing the panel type. The PS Vita 2000 will be going on sale in Japan on October 10th for ¥18,980 JPY, or approximately $190 USD. Sony is calling the new model more affordable – reinforcing our belief that the LCD panel is TN – so there’s good reason to believe it will launch at or below the current $199 price of the original PS Vita once it launches in North America. Moving on, Sony’s other Vita related announcement of the evening was a new micro console that appears to be targeted straight at the Ouya and other sub-$100 TV/gaming consoles. The PS Vita TV is for all practical purposes a headless PS Vita – right down to the SoC and cartridges – offering the ability to access the Vita’s game, video, and application library in a cheap external device to be hooked up to a TV. Being based on the Vita hardware in a miniscule 6.5cm x 10.5cm x 1.3cm package, the game situation for PS Vita TV will be relatively straightforward. 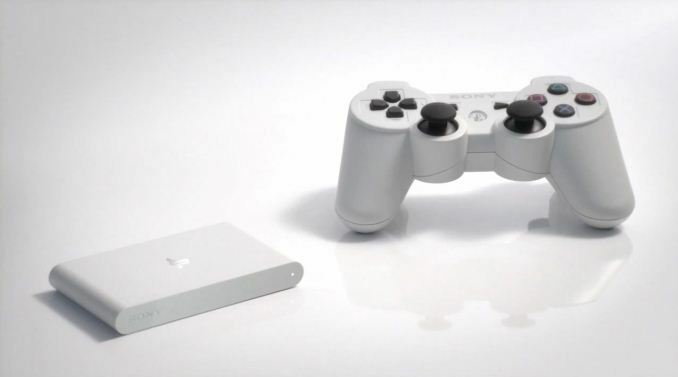 The PS Vita TV will initially be paired with Sony’s DualShock 3 wireless controller, making it possible to play many but not all PS Vita games. This includes both download games and cartridge games through the inclusion of both the Vita game cartridge and Vita memory card slots. However games that specifically require the Vita’s front and rear touchpads present an obvious challenge. In a Sony promo video the PS Vita TV is also shown to be working with a DualShock 4 controller, whose touchpad should alleviate most of those issues. Meanwhile Sony is being a bit vaguer about media options on the console, which of course will play into regional restrictions. The standard PS Vita currently supports Sony’s PSN store video, YouTube, and Netflix, while Hulu was specifically mentioned in Sony’s conference as coming to the PS Vita TV. 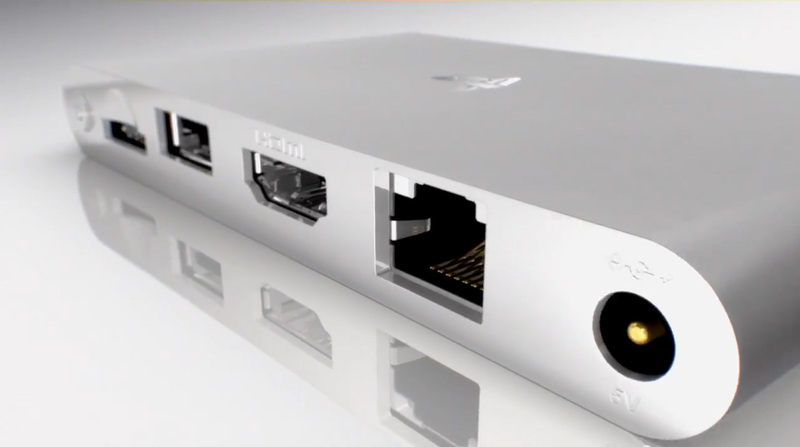 In terms of connectivity the PS Vita TV offers the Vita’s standard WiFi/Bluetooth connectivity suite, along with a full size USB port, an HDMI port for video out, and a 100Mb LAN port for hardwired Ethernet. It’s worth noting that since this is being driven by the same SoC as what drove the Vita – specifically a quad A9 melded with a SGX543MP4+ - Sony’s spec sheet unsurprisingly notes that it has limited TV out resolutions. 720p is supported, but 1080 is limited to interleaved mode with 1080p unsupported. There’s no word at this point about what resolutions various games and applications will run at, though the most reasonable assumption at the moment is that Vita games will run at their standard resolutions (960x544 and below) while PS Vita TV compliant video applications will be able to run at TV native resolutions. Along with PS Vita game support, like the PS Vita the PS Vita TV is also slated to get PS4 Remote Play support, powered by the same real-time video streaming mechanisms that make Remote Play possible for the Vita. This the first time we’ve seen a major console offer a satellite micro console in this fashion, and consequently the first to allow playing games on a remote TV, though with the existing Remote Play functionality and reuse of the Vita SoC it is a relatively straightforward option to provide. Wrapping things up, like the PS Vita 2000, the PS Vita TV will initially be launching in Japan. Arriving November 14th, Sony will be selling both the bare console for ¥9,480 JPY (about $95 USD) and a kit containing the console, a DualShock 3 controller, and an 8GB Vita memory card for ¥14,994 JPY (about $150 USD). No launch date was given for North America, but given the timing of the PS4 in the West, the DualShock 3 bundle may be unique to Japan as the DualShock 4 will become available shortly thereafter. It's a real shame about the PS Vita TV's video output options. I passed on the original Vita hardware due to the plastic touchscreen (rather than glass) and the lack of TV-out. I was hoping for an updated version to include these features, and perhaps update the OLED display. This new device seemed like the perfect option because I don't really want the handheld portion of it - just access to the games. I think between the "stay the course PS4", the PS Vita TV and the WiFi camera lens, Sony is on a roll. I think Sony announced a ~30% price cut for the memory cards in Japan, and a new 64GB card.